Well this racy little number sounds much more aggressive than it should! Volkswagen’s smallest GTI, the VW Polo GTI, is now on sale in Australia and its great fun to drive. If you would like your drive to work brightened up, then the 2018 Polo GTI might be the car for you. A brand new Volkswagen Polo GTI is relatively cheap to run and maintain. Volkswagen know how to make some of the best turbo petrol (TSI)engines in the world and they are praised for packing plenty of power but without having a huge thirst at the pump. Polo hatchbacks have sold like hot cakes in Europe, and for good reason. Polos are cheaper than a Golf but aren’t much smaller inside – particularly when it comes to occupant space. However, they are as fun to drive as a Golf, and in the GTI form, the new VW Polo is a hoot! New look Volkswagens are pretty cool. They have lots of exterior detailing in the form of creases which make for a car that’s a little more unique and somewhat more glamorous than you would expect. Adding chrome into the creased Polo GTI design just gives more flavour, more attraction and more muscle to the little Polo Hatchback. Of course, being a GTI means that you also get wider rims, air foiling, suspension and chassis performance upgrades, and then there’s that wonderful poppy GTI engine note. 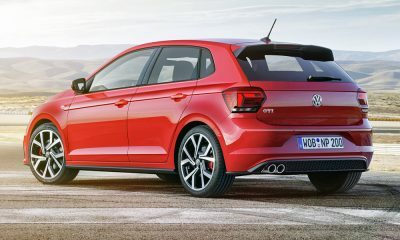 At the front, the Polo GtI has an imposing look, while at the rear the styling is very nicely worked for a tidy finish with twin exhausts and toned features. A wide range of exterior colours and combinations are offered on the new Polo platform. There will surely be a combination that grabs you, and you can even have your roof coloured in a different colour – just for fun. Offered as a five-door, the 2019 Polo GTI is easy to get in-and-out of. Once you’re inside, the interior is quality and the design made to make you feel special. Seating for the driver is really snug and form fitting, giving excellent comfort for hours at the wheel. You’ll like the new GTI seats which are upholstered in a tartan pattern with red accented stitching. 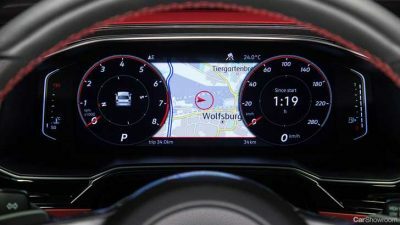 Aluminium pedals, red stitching on the leather steering wheel, a GTI logo on the steering wheel, red stitching on the gear selector lever and, in the GTi Plus, a Digital driver’s display with a red theme to it, all add up to a delightful blend of styling that makes you smile. 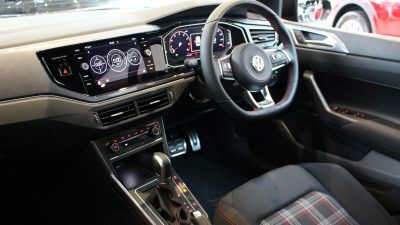 All the switchgear and touchscreen equipment is nicely within reach and you do feel like you’re in a sports cockpit rather than a granny hatch. You can set up your new Polo GTI with a choice of suspension damper settings, so if you really want to tackle the serious turns at speed – you can do so in Sport Mode. Normal mode is absolutely fine for most quick drives, and it’s a little more comfortable, too. Actually, the Polo GTI rides nice for small hatch. Sport mode also ensures some really quick launch times, thanks to the automatic gearbox and one-or-two other fancy electronics. Yes, this is a quick and fun car to drive. You’ll see the 0-100 km/h sprint done in less than seven seconds and, if you want to, the car just keeps on gaining speed deceptively fast well past 100 km/h. Even at well above legal speeds the new VW Polo GTI rides very tightly and in control. There are 200 horses (147 kW) under the bonnet along with 320 Nm of torque, so this little hot hatch can keep up with the big boys. The bigger, wider tyres sit on lower profile rims, so the Polo GTI does give great road-holding at the expense of some extra road noise – but hey I’m not complaining; it’s way too much fun! All that performance doesn’t come at the cost of fuel efficiency either, with the new Polo GTI consuming close to 6 litres/100 km, on average. If you want a great all-round performance hatch that’s not as expensive as a Golf GTI, then the new Volkswagen Polo GTI is the one. Well, it does it for me! 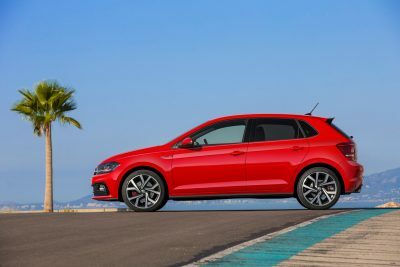 For any more information on the new 2019 Volkswagen Polo GTI or, for that matter, any other new car, contact one of our friendly consultants on 1300 303 181. If you’d like some fleet discount pricing (yes even for private buyers! ), we can submit vehicle quote requests out to our national network of Volkswagen dealers and come back with pricing within 24 hours. Private Fleet – car buying made easy!